Bad habits. We all have them. 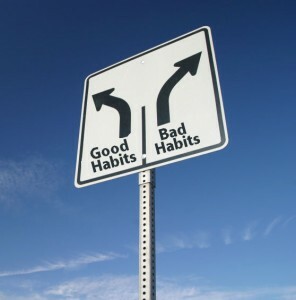 While sometimes annoying or counterproductive, many bad habits are relatively harmless. Biting your nails, procrastinating, snapping your gum, sleeping with your makeup on, the list goes on. Over the years, I have developed habits with my diabetes that aren’t always constructive. For instance, I leave used test strips in my case and wait until there is a pile of them before I throw them away, often losing a few inside my purse or on the ground before this happens. I also have a habit of leaving half eaten packets of fruit snacks all over the place where they eventually get stale or lost at the bottom of my purse or pockets. I admit that none of these are good behaviors, but they are all pretty harmless. So you’re probably thinking, “Just start blousing before your meals and problem solved.” Well I know myself pretty well and for me, nothing is ever that simple. Giving insulin before a meal is a concept I’ve known about for years, so the question is, why don’t I? When you give insulin before you eat, you have to know how many carbohydrates you will be eating so that you know how much insulin to give. The problem that I have with giving insulin before you eat is, what if you start your meal and then end up not eating as much as you anticipated because maybe you got full? While you can always give more insulin if you eat more, you can’t take it away. Too much insulin means that your blood sugar drops. So essentially if you give insulin for 30 carbs, you better eat 30 carbs. While pondering all this, I had a flashback to when I was in the hospital after I was first diagnosed. It was a memory that I haven’t thought about in years, buried deep in my subconscious. I’m sitting in my hospital bed and it is dinner time. The hospital staff had just dropped off my tray of food. I looked at the label on the tray, it was a “diabetic meal”. I remember glancing at my roommate’s dinner and asking my parents why I couldn’t have what she was eating, I wanted mac and cheese and a chocolate pudding cup, instead of the bland meal in front of me. I picked at my food, but I didn’t have much of an appetite. I remember telling the nurse that I was all finished, but she told me I had to eat more. Why? I’m not hungry. I don’t want it. But the thing is, I had to, she explained. I had already been given the insulin for the food in front of me, I needed to eat a certain amount of it. Here I was, sitting in the hospital, at the mercy of a disease that would soon control and consume so much of my life, and I couldn’t even control how much food I could eat. That’s what it comes down to for me. Control. I try so hard every day to control my blood sugar levels and to essentially control my diabetes. When it comes to food, my diabetes often dictates when I need to eat, what I should and shouldn’t eat, and when I’m low, how much I should eat to feel normal again. How much food I eat, being able to stop when I’m full, and eat more when I’m hungry is such a basic freedom, but a freedom nonetheless. I don’t want to be “forced” to eat more food, consume more calories, and put food that I don’t want into my body. When I give insulin before a meal, it feels like I am giving up control to my diabetes. I’m letting it dictate how much I have to eat, even if I don’t want to. When I give my insulin after, it means that I decide how much I want to eat and then I give the appropriate insulin. I am in control. I know plenty of other diabetics give insulin before meals without sharing this feeling of loss of control. But even though we all share the same disease, our experiences and thought processes are so different. While this issue of bolusing before a meal may be a non-issue and no-brainer for some people, I know it’s going to be a struggle for me. So how do I maintain my sense of control while still being able to address the spikes in my blood sugar that are most likely resulting from the delayed insulin? I’ve given this a lot of thought over the past few days, and I know I need to make some changes. Luckily I have a meeting with my endocrinologist in a week and can talk it over with her. I’m thinking I will either try to give a half to three fourths of my insulin before the meal and the rest after, or do the rest as a square bolus over time. That way, if I do eat less than I think, I can either not give the remaining half or one fourth or stop the square bolus. Ideally I would work to give it all before, but I know it’s going to take me some time and some getting used to first. Maybe this arrangement is not ideal, but right now it’s the best I can do and I know that it is a step in the right direction. It is important to me to feel in control of my health and my diabetes, I can’t let my diabetes take away that feeling, even if it is just how much food I eat. I think you have the perfect solution right there at the bottom of your post! As I was reading through, I was going to suggest that you bolus for half (or whatever you believe you really will eat), and then after the meal (or during) bolus for the remainder. I actually do that quite often, in a sense. I bolus for what I know I'll eat, but inevitably I find myself going for a second-helping of something and have to add an additional bolus for that. I've always thought about this because I too bolus after meals. But whenever I try to bolus before a meal I will invariably end up not liking / not eating whatever it is I bolused for. It's like Murphy's Law. I know in the long run I need to work on it, but it's just so hard. At the very least, I always try to give a correction dose before eating, so at least I'm not going *that* much higher.